Winter was the perfect, amazing ending to this lovely series. It’s hard to believe that this book was 823 pages long because it feels like it flew by. A bit too fast even, because now it’s over. And I’ll never again be able to read about what the characters are doing or enjoy their banter and interactions, which just makes me sad. Because let’s be honest: the characters and their interactions are really what make this series so great. The worldbuilding is good. The plot is great. The writing style is fun. But the characters, they are just phenomenal. I was smiling like a loon during every scene where they were together. Their banter is just so much fun and felt so real. Yes, there is a lot of romance and the romance is great, but the friendships are amazing too. I think Cinder and Thorne are my new favourite friendship ever, though they are in tough competition of Cinder-Iko, Scarlet-Winter and even Thorne-Kai. But come on: that high-five alone catapulted them directly to number one. Anyway, focusing on Winter here. 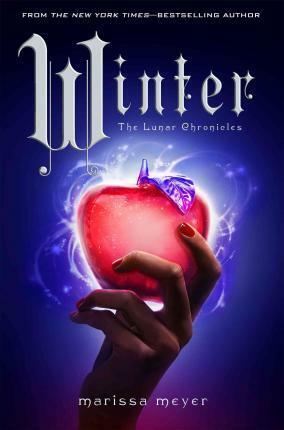 In this installment we again meet Winter and Jacin and learn more about them. I loved Winter. She is so fun and sweet and completely delusional but it makes her such an original and lovable character. I was hesitant about her at first, but you just can’t help but love her. She’s charming like that. I especially loved her in her interactions with Scarlet because pairing the strange and crazy Winter with the realistic and painfully honest Scarlet is just genius. I’m ok about Jacin. I did not like him in the previous book, but in Winter you really start to understand why he is the way he is. And you can’t help but feel for the guy when you see how he is with Winter. He’s still not my favourite of the gang, but he does fit in nicely. I also really liked the fairytale elements in Winter, probably the most of all the books. The evil queen, the fairest of them all, the apple candy, the true love’s kiss. They were all incorporated so originally, and so perfectly. That’s not to say that I did not love the fairytale aspects in the other books, but in Winter they just felt more magical for some reason. The plotline was great. The entire book is a fast paced, action-packed adventure from start to finish. I loved that the gang was on Luna and that the revolution was finally coming into play. I really liked how this revolution was written too. It was definitely not easy and a lot of bad stuff went down. I was on the edge of my seat the whole time and though the story is a fairytale retelling, I was very worried about the happily-ever-afters throughout the entire book. Overall, this was just a really, really satisfying ending. Endings are pretty hard to write, but this one is definitely up there in the top 5 best series endings ever. I have a few little nitpicks about it, but honestly I am totally willing to overlook them just because this series and these characters made me so very happy. “And yet strangely lacking in any sort of actual strategy,” said Scarlet.